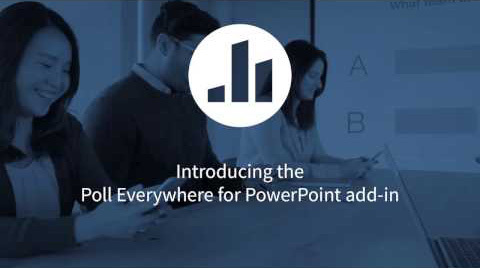 SAN FRANCISCO, CA March 16, 2017/PR Newswire — Poll Everywhere announced a series of time-saving improvements for professional PowerPoint users, the second-largest update to the Poll Everywhere PowerPoint add-in in the company’s ten-year history. Once considered experimental, collecting live audience feedback is now standard practice for professional presenters and corporate educators. The latest changes to the add-in reflect the audience response software’s central role in meetings, live events, and presentations. In the first version of the add-in, Poll Everywhere slides displayed a generic placeholder image until it was time to present live polling content. Now, when a presenter adds a Poll Everywhere slide to PowerPoint, each slide shows a preview of the poll activity it contains. Preview slides provide a visual overview of every single activity placed in the presentation. The slides can then be rearranged by drag-and-drop, just like standard PowerPoint slides. The update was one of the most requested features for high-volume presenters. Professional speakers like Jim Carroll, for example, who has a client list ranging from NASA to Pfizer, frequently prepare dozens or even hundreds of poll slides at a time. For Carroll and his peers, the ability to preview live polling content in thumbnails drastically cuts prep time. Once the presentation ends, presenters can swap the poll slides for snapshots of real response data from the audience. It’s an indispensable tool for presenters who rely on that data to inform business decisions. The Georgia Chamber of Commerce, for example, uses Poll Everywhere polls to shape policy efforts. Gathering, collating, and sharing feedback from their business owners is essential to the Chamber’s mission. Together, these new features signal the growing role of live audience feedback in presentations. Microsoft, the company behind PowerPoint, recognizes the demand for interactivity in its trademark presentation software. In 2014, Microsoft partnered with Poll Everywhere to feature the audience response system as an Apps for PowerPoint Hero. “We couldn’t be more inspired by the contextual solution Poll Everywhere has built for PowerPoint,” Dene Cleaver, product marketing manager for the Office Store at Microsoft said when the partnership was announced. In 2015, Microsoft began pre-installing Poll Everywhere in the PowerPoint iPad app. Continuing the trend, Microsoft featured Poll Everywhere on the “Office | Better With” blog in January 2017. Collectively, these moves signal a fundamental shift in the central role the audience plays in every presentation – and the vital role tools like Poll Everywhere play to keep presentations engaging and inclusive. Poll Everywhere creates real-time conversations between presenters and audiences. Used by more than half of the Fortune 1000 and educators around the world, the San Francisco-based startup was founded in 2007. Poll Everywhere is available on the web or in PowerPoint, Keynote, and Google Slides. Learn how it works.